Spring bulbs are here for such a short time; you don’t want to lose a minute of them. 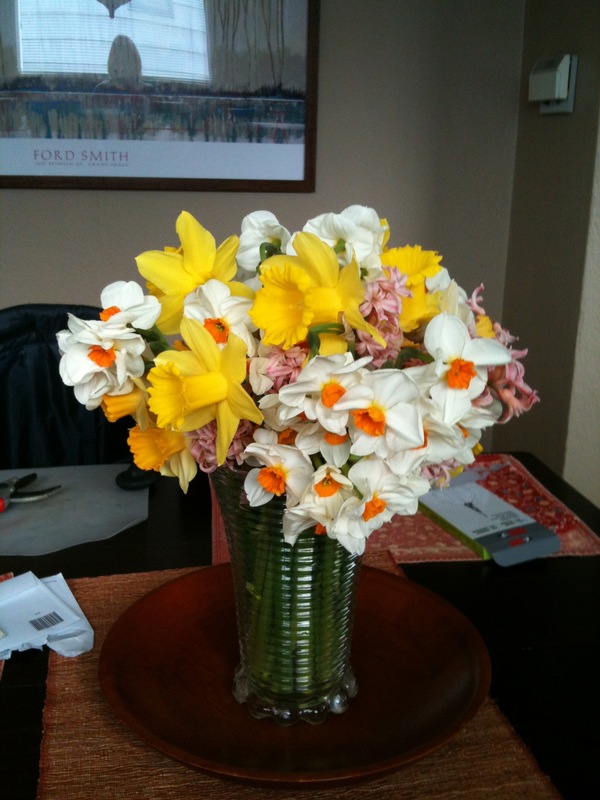 Is it really true that homegrown daffodils and tulips should not be in the same flower arrangement? Well, yes, it is a very bad idea. Daffodils produce a slime that tulips can’t tolerate. So, if you really, really want them together, put the homegrown cut daffs in a separate water filled vase for a day until the slime disappears. Take them out of that water and then you can arrange them with tulips. Sounds like a lot of trouble to me, too. I suspect that the daffodils you buy in bunches have already been de-slimed since they are usually sold from a container of water. The two most common mosses found in garden centers, “the mosses”, are Scottish and Irish. Scottish moss is the golden one and Irish is the emerald green one. The only real difference is color. They both grow best with four to six hours of sun in good soil and average water. They are typically used to soften the spaces between stones, steps and pavers because they tolerate foot traffic. They are tough but soft, easy but effective. They are good “tuckers and softeners” and they create their own landscape when planted at the base of a rock or an old stump. They add lushness wherever they are used and no respecting secret or fairy garden can go without a little patch of moss. By the way, Irish and Scottish mosses aren’t true mosses. They have little blooms and true mosses don’t. If you like the soft, mossy look but not the solid, dense look of Scottish and Irish moss try the lacier look of Selaginella. All the true mosses and “not quite mosses” add a soft texture to the garden that no other plant can achieve. They are backgrounders and blenders but they can change the “feel” of any landscape. All you have to do is read author Annie Martin’s poetic description of the beauty of moss and you know she has a serious moss addiction. 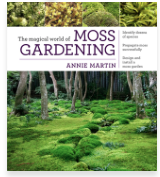 Thanks to Martin’s research and hand on experience “The Magical World of Moss Gardening” is probably the only reference you’ll need to dive into gardening with moss …the politics (timely), the history and the use and cultivation. The politics…Martin points out that 5% of air pollution in the United States can be traced back to lawn mowing…no lawn mower needed if you decide to grow a moss lawn. Since we have no trouble growing moss in our South Sound lawns, the thought of cultivating the moss instead of the grass is very tempting. Martin tells you exactly how to do it. Beginning with beautiful examples of established moss gardens, followed by an encyclopedic list of recommended moss varieties and rounding it out with all important maintenance information, “The Magical World of Moss Gardening” might just be the tipping point for the slow demise of the grass lawn. Here in moss country it makes perfect sense. To see a local and truly amazing moss garden visit Bloedel Reserve on Bainbridge Island. www.bloedelreserve.org.